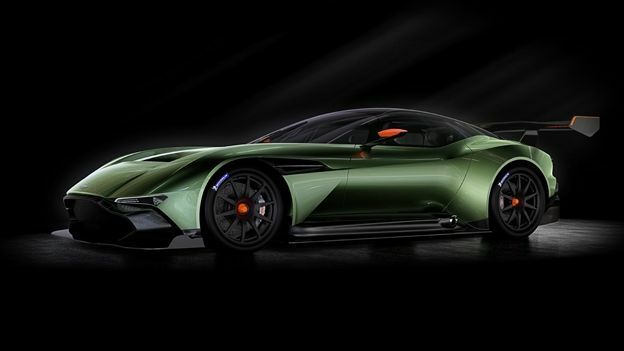 Inspired by Aston's successful motorsport division, the Vulcan is a race-tuned carbon-fibre behemoth. Despite being installed with a full FIA rollcage, it still has a power to weight ratio that"exceeds those of the GTE cars which compete in the FIA's World Endurance Championship". There's also the small matter of a 7.0-litre, naturally aspirated V12 engine that sits near the front of the car, delivering over 800bhp to the rear-wheels via themid-mounted Xtrac six-speed sequential gearbox. It's ridiculously low - just 1186mm tall - and here's also a limited-slip differential, magnesium torque tube with carbon fibre propeller shaft and Brembo racing calipers acting on carbon ceramic racing disc brakes. So essentially, what we're looking at is a carbon-fibre shell, an 800bhp engine, and a rollcage so you don't die. Aston Martin is only making 24 of these boxcar derby death-traps so you'll have to fork out a whopping£1.8 million for the pleasure of riding in one. Not only that, the Vulcan is so powerful you can't even drive it on the road - you'll have to keep it near a race track. If you do decide to plonk some money down on one, your wad of cash will not only pay for the car, but also for an in-depth track lesson fromAston Martin Racing's Le Mans-winning Darren Turner, who will guide you through the art of racing in a number of high performance Astons including the V12 Vantage S, One-77 and the Vantage GT4 race car.